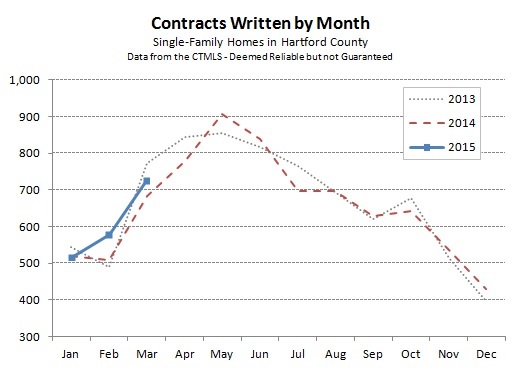 Hartford County finished the month of March with 726 single-family home contracts, an increase of 6.3% over March of 2014. There continues to be excitement and energy around the real estate markets. Buyers are out in force, and seem confident about bidding on homes. On a year-to-date basis, the price bands of $100,000s and the $200,000s have shown strong outperformance over the first quarter of last year. There have been 6.8% more deals for homes with asking prices in the $100,000s, and an impressive 23.4% more deals for homes with asking prices in the $200,000s. At 4.8 months of inventory, the number of homes available for sale is in line with what we have reported for the beginning of April in past years. Listings will continue to come onto the market over the coming months, as April and May are usually the months with the highest number of contracts signed. Contract data continues to vary significantly within the County. 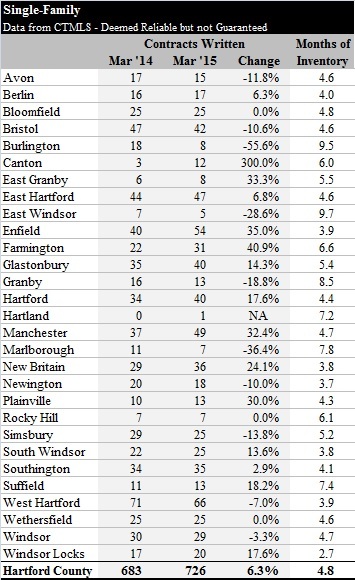 Windsor Locks had a very strong first quarter, finishing with a 40% increase in the number of deals. It is also the town with the lowest inventory level by a large amount … it’s apparently a good time to be a seller in Windsor Locks.